Daniel studied at Griffith University on the Gold Coast in Queensland. He completed a Bachelor of Exercise Science degree and then a post-graduate Masters of Physiotherapy, graduating in 2013. 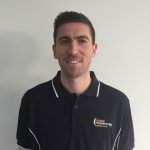 Daniel has worked with local sporting teams including the Somerset Heat and Burnie Dockers. He was also the physiotherapy consultant for Edithvale-Aspendale Football and Netball clubs in Victoria. Personally, Daniel has a very keen interest in sport and fitness, in particular basketball, athletics and strength and conditioning. He enjoys competing at the local Christmas carnivals and Stawell Gift. Daniel has also represented Tasmania at the Australian National Athletics Championships on a number of occasions. In his spare time he coaches athletics and writes strength and conditioning programs.